When it came out in the middle of January that Trion was considering what seemed to be a Rift retro-server called Rift Prime, I was on board with that. But it wasn’t promised until Spring, and we know that could me as late as mid-June. I’m not going to start the season/calendar discussion again. Well, I won’t go full on about season, but a month later we learned that up somewhere in San Mateo County Spring shows up before Daylight Savings Time as the Rift Prime server was slated to open up on March 7th, which was yesterday. That was much sooner than I expected… or, technically, sooner than they led me to expect. Still, I was ready… or almost ready… or ready-ish. I was kind of hoping to have worn out WoW for a bit so I could walk away from Azeroth until the Battle for Azeroth launch events started to kick in. I had, however, already recovered my account and set it up with a new password I might remember for a bit, grabbed the Glyph launcher, and downloaded Rift so it would be ready to go when the time came. And yesterday the time came. Peeking at Twitter on my phone, it seemed like perhaps things might not have gone as smoothly as hoped for the launch of Rift Prime. I heard the server was down for a while, there are still leftover threads in the forums complaining about problems, and there was even mention of a login queue. The latter must have been encouraging, even given the former. All in all it was starting to sound like an EverQuest progression server launch. Again, encouraging that it was popular enough that the load was bringing down the server I suppose. I wondered if I might be better off waiting for the weekend before poking my nose into the game. But by the time I got home and had some time to sit down and give things a try the issues appeared to have been settled. Of course, it took be a bit to get that far. I was still trying to gauge my actual enthusiasm for the venture. I have fond memories of playing Rift with the instance group for over a year back in the day… but back in the day was 2013. I really haven’t played at all since I gave up on the Storm Legion expansion. That made me leery of over committing. I was not, for example, up for their $30 Primogenitor Pack. 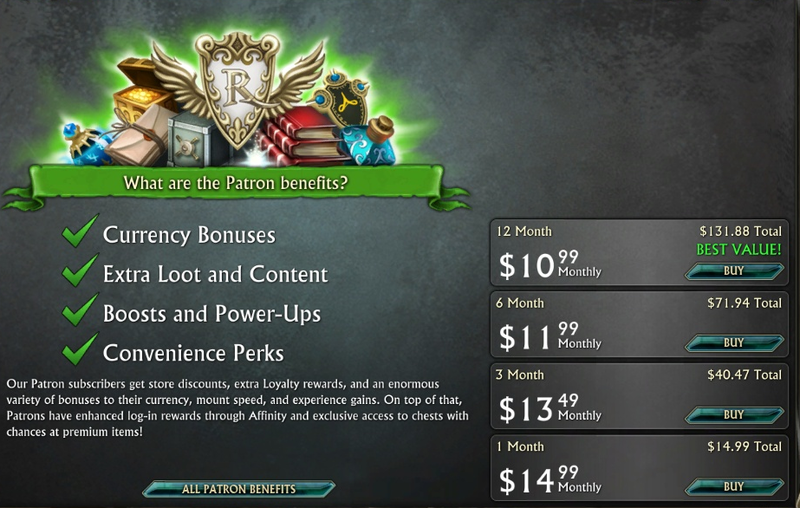 And then somebody mentioned being able to buy Patron access with the RMT currency. 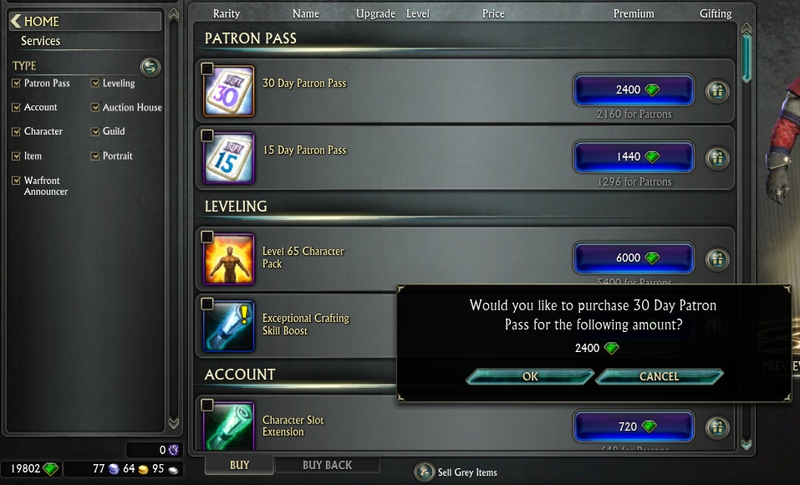 When the game went F2P way back when Trion gave me 20K of that. Logging into the Rift live servers, I found that I still had well over 19K of that left. Using that rather than real world money seemed like a plan. So I started looking in the store. They were keen to sell me patron status there for real world money. Elsewhere, under the Services option, I found what I was looking for. 2,400 credits for 30 days was what I was looking for. 30 days is about the level of commitment I am willing to sign up for. If it get wrapped up in it and things are going well, I’ll buy more time. But for now that is all I need. After that it took me a few mins to figure out how to access Rift Prime. 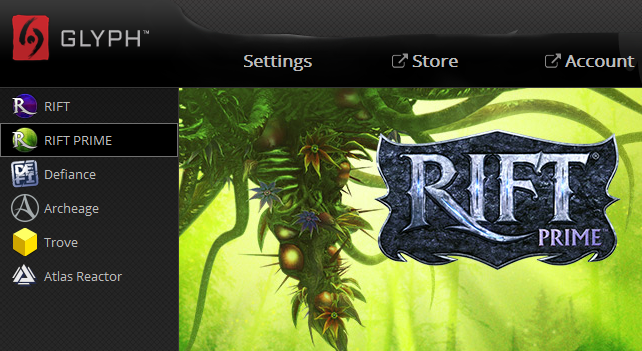 It is actually setup in the launcher as its own game. Once I found that, I was able to log in and roll up a new character without issue. The server was up and whatever “rush to get in” queues had apparently dissipated by late evening. We’ll see if they light up again come the weekend. I even got the name Wilhelm on the server. That never happens. He is a big Bahmi cleric. Now to see what Rift Prime and its Vigil server has to offer. That will probably have to wait for the weekend. Somewhere along the way I managed to infiltrate Liore’s circle of gaming pals and there is some interest in giving Rift Prime a try, so there might even be a guild and some people to do dungeons with if things go well. We shall see how it plays out. 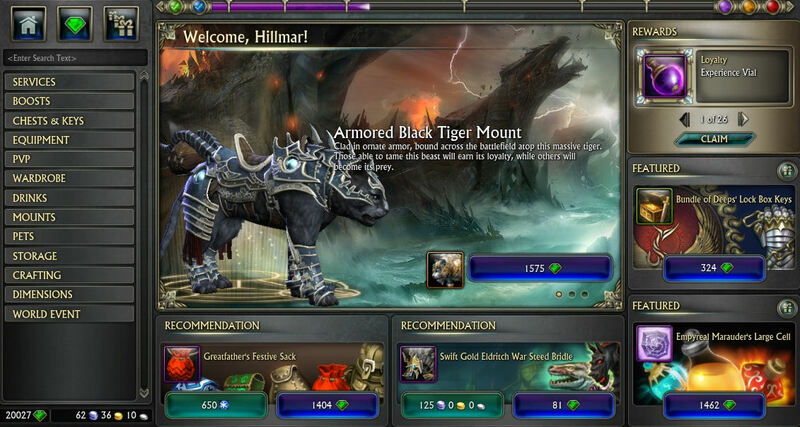 This entry was posted in entertainment, Rift and tagged Rift Prime on March 8, 2018 by Wilhelm Arcturus. I still don’t think I’d play much though. I think I’ll sleep on it and decide tomorrow. Or after you write a couple of reports. I guess now I have the means I can afford to wait for the opportunity.